Facebook is continuing to make moves to strengthen its platform in an effort to build trust with its users and advertisers. In just 2019, they’ve made great progress in fighting misinformation and boosting the authority of content posted on the platform. This week, they posted a slew of announcements to their Newsroom blog regarding the steps they’ve taken, and what they’re planning to do to moving forward to limit the spread of “fake news,” hate speech, and other content that violates Facebook’s Community Standards. Essentially, Facebook is planning to build upon its “Remove, Reduce, Inform” process first announced in 2016. While Facebook has many measures in place to prevent content that violates its Community Standards from being posted, some can still slip through the cracks. When that happens, the goal is to catch and remove it as quickly as possible - but doing so has presented challenges. This problem persists most frequently in closed Facebook Groups. Facebook does have systems in place that will catch around 95% of these infractions, but found its team needs to be doing more to hold Groups accountable for upholding Facebook’s community standards. In response, they have put two new standards in place. First, they added a “Recent Updates” tab to their Community Standards site. This tab will show any standards that have been added or updated in the last two months. Because Facebook’s terms can change so frequently, it's important that users have access to up to date information on what is considered a violation. To boost compliance, Facebook is holding group admins more accountable for violations of Community Standards. 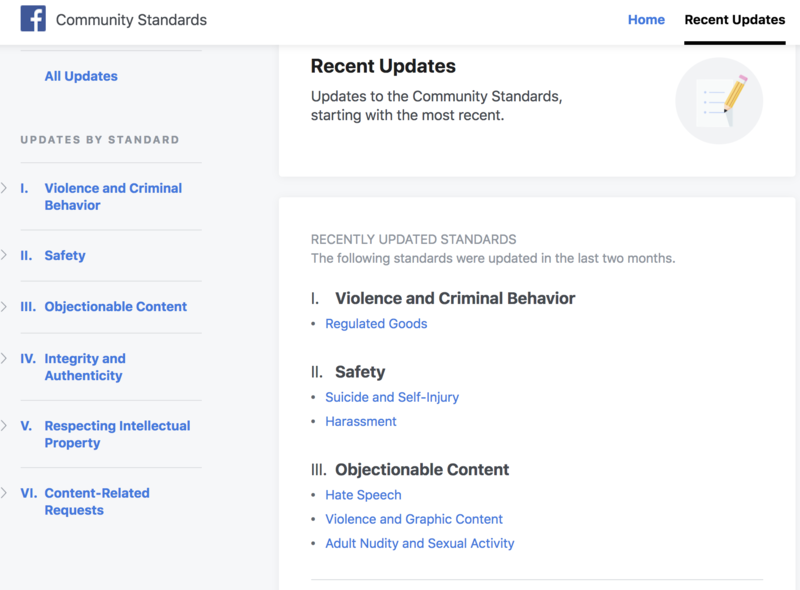 Additionally, Facebook is introducing a new tool called Group Quality to increase transparency surrounding what it considers to be a “violation” of it’s Community Standards and when they enforce it. The feature will show a historical overview of content that has been removed or flagged for violations, and will show a section for any false news posted in the group. It’s currently unclear if only group admins can see this feature, or if all group members are able to view it. This section refers to content that is problematic or annoying, like clickbait, spam, or fake news - but doesn’t necessarily violate Facebook’s Community Guidelines. For example, you could share a blog article on “scientific research” on why the Earth is flat, and even if the content isn’t factual, it doesn’t violate Facebook’s standards. This “grey” area between what’s just misleading and what’s truly harmful is why Facebook has had such a hard time limiting the spread of misinformation on its platform. Contrary to popular belief, the right to Free Speech doesn’t apply to private companies like Facebook (I didn’t realize that needed to be said until I saw Twitter’s response to this news). So while Facebook wants to allow all users to express themselves on the platform, they are well within their rights to put additional guidelines in place to enhance the content posted to the platform. 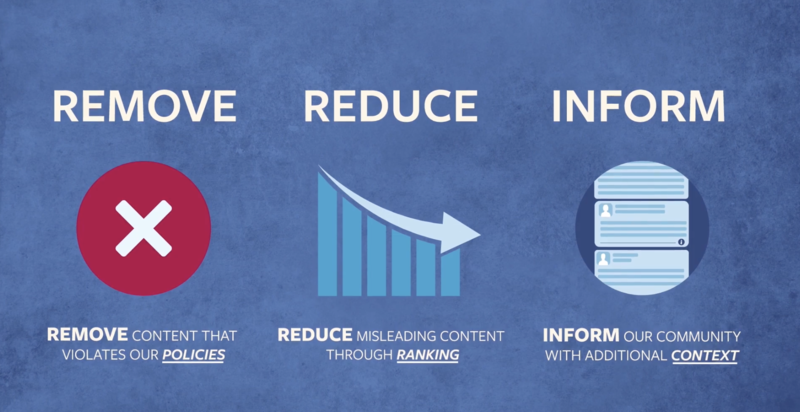 Expanding its third-party fact checking program: Now, The Associated Press will be “expanding its efforts by debunking false and misleading video misinformation and Spanish-language content appearing on Facebook in the US”. Limiting the reach of groups that repeatedly share misinformation: Groups that have consistently been flagged by fact-checkers for sharing misleading articles won’t have as much exposure in members’ News Feeds. This provides additional incentives for admins to police this content on their own, and also limits members from seeing the posts unless they seek them out in the groups itself. In order to truly make an impact, it’s important to not only limit the spread of misinformation, but also educate the public to inform their own perspective. The problem with social media, and the internet in general, is that if you see a headline or read a statistic, you’re inclined to believe it. Because Facebook users can post whatever they want, it makes it difficult to separate what’s credible and what isn’t. So, rather than simply take reactive measures by removing and limiting the exposure of misinformation non Facebook, it’s important for people to know how credible these sources are before they decide to believe them. In the past year, Facebook has added features help users determine a source's credibility on their own. Now, they’ve announced expansions of of these tools that will provide even more transparency into these sources. First, Facebook’s Context Button is getting some new features. This tool was first launched in April 2018, and provides people with more background information about the publishers and articles that appear in their News Feed so they can better decide what to read, trust and share. Now, Facebook is adding Trust Indicators to the Context button. This was created by the Trust Project, which is made up of an association of news organizations dedicated to fairness, accuracy, and transparency in news reporting. Moving forward, Facebook's articles will be evaluated against the Trust Indicators eight core standards to evaluate credibility. Additionally, the Context Button will now apply to photos that have been reviewed by third-party checkers. Facebook’s Page Quality tab will also be getting new information to help users better understand if the page is biased or trustworthy. This will be continually updated over time as new information is identified - but Facebook is starting off this month by updating the page’s status with respect to how often they post “clickbait” articles. Whether it’s Facebook’s fault or not, it’s undeniable that the spread of misinformation has gotten out of hand. 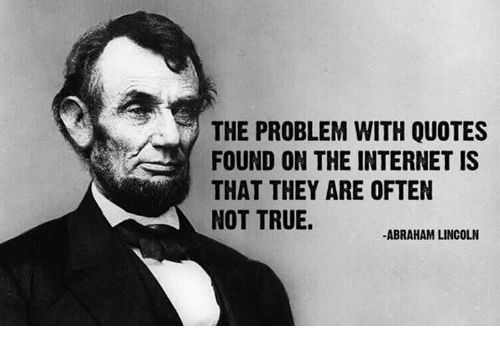 It’s true that everyone is entitled to their own opinion, but it’s important that people draw their conclusions based on facts, not false information. These updates have important implications for marketers as well. If we want prospects and customers to trust our information, we should be mindful of the groups we’re in, the articles we share, and the content we put out. For example, if you post an article that has exaggerated statistics or information from a source that has the potential to be flagged by Facebook, it might reflect poorly on your brand even if you thought it was factual before you posted it. These updates are a reminder that the industry is changing, and it’s likely that social media will soon have similar restrictions to what you’d see on cable television. This isn’t necessarily a bad thing, but does have the potential to disrupt the current way you use social media to market your business. So, as always, stay on top of the changes, and be proactive in adapting your strategy.